During my time in Australia, some of which I spent travelling around the country, I realised that there’s no escape. I was picturing a secluded part of the world, literally the furthest away from my home country, where I would be left in peace and have a chance to immerse myself into a different culture, completely unfettered by my roots, for a while. But no! Not only did I not feel secluded at all because, obviously, there was e-mail and Skype – and even people on the telephone in Europe sounded like they were just around the corner. But also, wherever I went, on every last bloody jeep safari into the remotest part of the bush, I would bump into fellow countrymen and women. Germans do like to travel. The World Tourism Organization UNWTO says that until 2011 Germans were the world champions of travelling, at least based on the money spent in tourism. Whenever my English husband and I are hiking abroad, he takes mischievous pleasure in a little pastime he calls Spot the German. Having trotted the odd part of the globe, he says you can always recognise Germans by their top-notch, super-organised equipment. 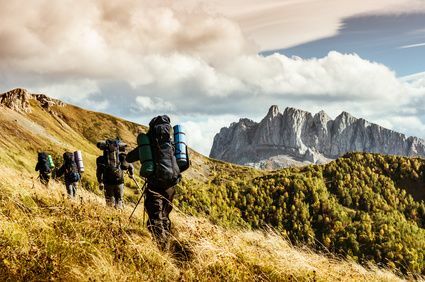 And by their Jack Wolfskin coats – which, he assumes, will expand into a fully-equipped tent or ready-to-use canoe at the hassle-free pull of a strap. I was surprised to hear he’d never heard of Jack Wolfskin before going backpacking. I thought it came from some English-speaking country, but it is actually a German brand. ‘You would never see a German on a hiking trail just wearing a pair of old trainers,’ says Mr K. Yes, we like to be prepared. That makes us feel safe. And when we’re prepared and feel safe, most of us will be in the right mindset to actually let our hair down. When I went on a trekking tour in Tasmania, I was incredulous at one Irish girl wearing trainers. It did say on the equipment list that rain and mud were to be expected. And this poor girl ended up with very, very, very wet feet, while my feet were nicely dry and snug in my Meindl leather boots. Sometimes it’s nice to be German. Now get your pickaxe, coz next week we’re going on a pub crawl.